The title itself is an oxymoron , these two words just don’t go together each fighting against each other. The reality is that when your part of this horrible group that we didn’t choose to join of bereaved parents, we have no choice but to choose a coffin for our child whether they are being buried or cremated. when my dad passed away two months before Órla, I had the horrible task of going to the local funeral parlour with my mum and arranging my dads funeral. The lovely lady behind the desk showed us a book of a selection of coffins and caskets all of which were grouped into price categories starting from around 2000 euros. We scanned the pages hoping that we would see some name or description that might stand out at us as if dad was giving us a sign to say ‘this is the one’ and sure enough there was The Tara, one of the names of the Stanley cookers my dads company made. We were sure this was the one he would have wanted. When it came to choosing for Órla I was adamant that it was going to be a lot more personal and not just a spur of the moment choice. We were fortunate to have time on our side as Órla had a terminal illness we knew she was on a downward path. I searched online for my options. I know white coffins are usually used for young children or babies but I didn’t like the idea of her being in a wooden box. I’d also considered the many different natural leaf/grass types which I initially Thought I would choose but I felt that Órla would think I’m putting her into a laundry basket just a bit bigger. 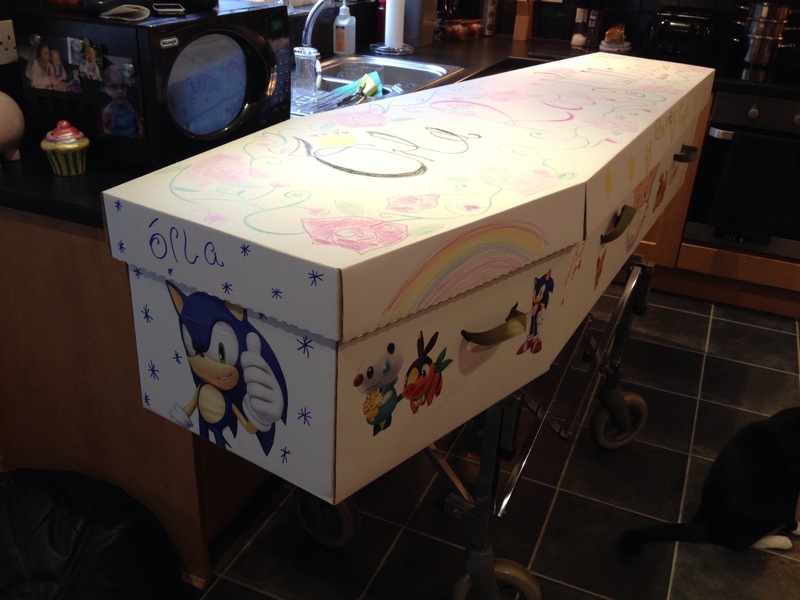 I then found a company in England that made bespoke cardboard coffins. This seemed to be my answer but on enquiring I found out that these types of cardboard coffins took 3 -5 days to make and deliver to Northern Ireland where I lived. It meant that if I was to choose this bespoke design I would have to order and pay for it in advance of my daughters death and of course I would also need somewhere to store it. 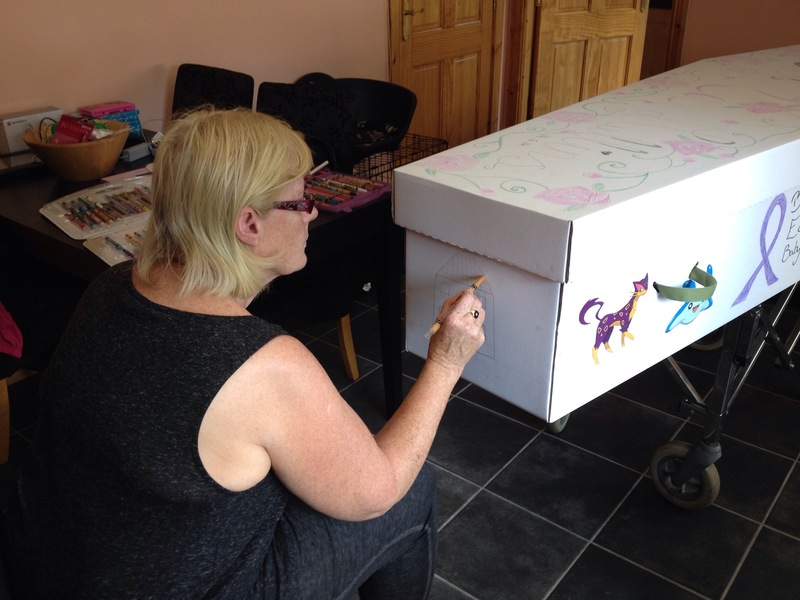 Now I knew Órla’s passing was coming quicker than I had anticipated but there was no way I was going to tempt faith even more by having my child’s coffin stored ‘ready & waiting’. By this time I was getting very frustrated. I realised that to get a coffin within a day or two it would need to originate from Ireland and cardboard coffins were still not allowed to be used in the south for cremation purposes. 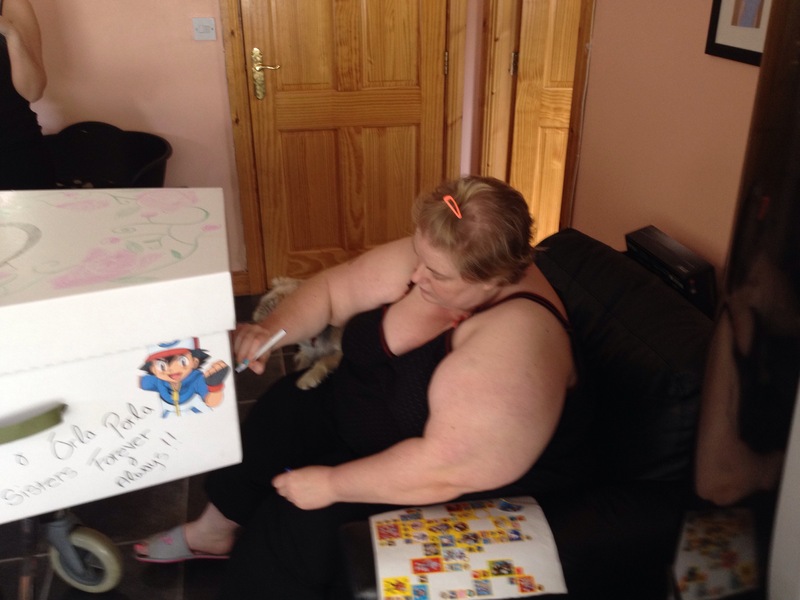 I searched the Internet and came across a company called greencoffinsireland and a kindly gentleman Colin McAteer who not only arranged for a white cardboard coffin which could be hand decorated by ourselves to be left with a local funeral home who would store it for me until I needed it but also refused any payment. The local funeral director rang immediately and wanted to arrange a meet up. I wasn’t too happy to involve a funeral home as I was very keen to keep this a low key intimate affair but I couldn’t have been more wrong about Paul McEvoy & Sons of Newry not only did he agree to store the coffin and deliver it when needed but he helped me with just about every aspect of arranging a funeral with total compassion and respect and completely out of his own pocket. By the end of that day I really felt God had sent me these two men (Colin McAteer and Paul McEvoy) to help lift my worries, I felt an instant bond with both as if my dad was reaching down from heaven hugging me and saying ‘I’m here’. Paul walked me through all the details of what was needed, took control of all the necessary forms etc which have to be filled in so I could concentrate on grieving. He agreed to be at my beck and call, night or day. When the afternoon of the 16th June came órla passed away peacefully at home. Paul as promised dropped the coffin up to the house that evening. 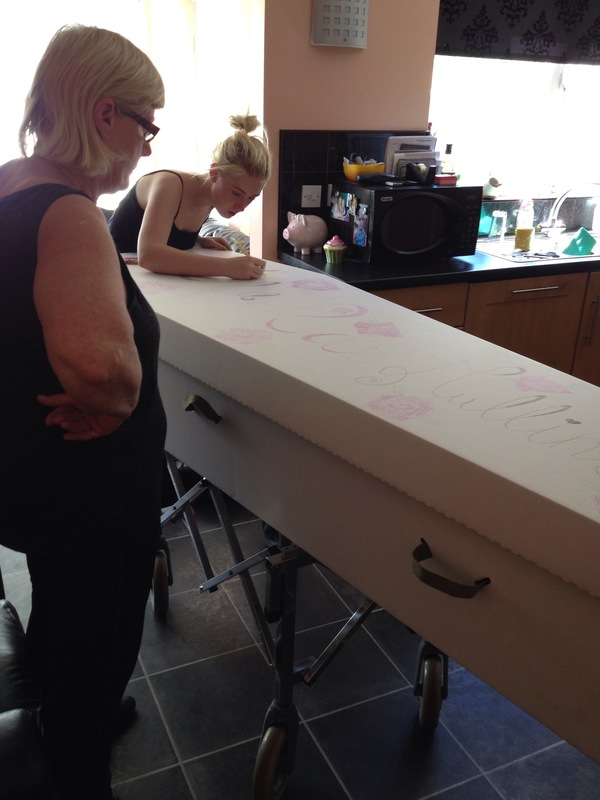 My mum, my other daughter Zoey and myself spent the next day decorating the coffin with special pictures/drawings and words that were important to órla. It was as I imagined very therapeutic, we laughed, we cried remembering the funny things órla would do & say and boy did this child have things to say. At the end we all stood back very proud of the vessel that would take my baby on her last journey, knowing that she would have loved it. Such a beautiful, personal story. Thank-you for sharing it. And yes.. God does do some amazing things in the midst of our sorrow … the men from the funeral home.